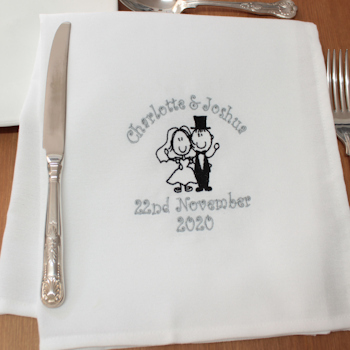 Bride and Groom stick people embroidery design white cloth dinner napkin that can be personalised with names and a wedding date. Bride and Groom stick people embroidery design white cloth dinner napkin that can be personalised with names and a wedding date. Enter the personalised names or date in the text box and select a text thread colour of your choice. Smooth polycotton table napkins with luxury feel approximately 47cm square with running stitch hems. This cloth napkin is a lovely keepsake momento gift. Fantastic for weddings, anniversaries, Valentine gifts and other special occasions.